Aloe bowiea Schult. & J.H.Schult. EOO 550 km², AOO 5 km². Locally extinct at four of seven recorded locations and documented population decline of 60-70% over the past 19 years, due illegal collecting, overgrazing by cattle, low income housing expansion and construction of the Coega Industrial Development Zone. Currently this species is extant in three severely fragmented subpopulations. With the planned industrial expansion of Coega, the anticipated influx of people seeking work there could result in massive urban expansion and large increased in cattle stocking rates. This species is predicted to experience a further 20% decline in the next five years. Subtropical transition thicket, in rocky soils on level to southwest-facing slopes. The habitat where this species occurs is currently being subjected to a number of threats. These include agricultural mismanagement, particularly overstocking and overgrazing during times of drought; the clearance of non-arable thicket for crop cultivation; industrial expansion; urban development; road construction; and unauthorised collecting by succulent enthusiasts. These latter few threats have lead to the extinction of the subpopulation at Uitenhage. In a survey of known subpopulations in 1983, Smith (1989) reported that as a result of the drought the vegetation at both the Uitenhage and Coega localities was severely overgrazed and badly trampled by domestic stock and game animals. Individuals were found grazed back to soil level. Similar evidence of overgrazed plants has been observed between 2003 and 2006 by volunteers from the Custodians of Rare and Endangered Wildflowers (CREW) Programme. In recent years (2000-2010) the expansion of Motherwell township has led to loss of a large portion of the population. In addition the development of the Coega Industrial Development Zone has led to loss of part of the Coega Kop subpopulation. Not recorded from any formally protected areas. Smith, G.F. 1989. The destruction of the natural habitat of Aloe bowiea (Asphodelaceae: Alooideae). Excelsa 14:117-124. Smith, G.F. 1991. Additional notes on the taxonomic status and habitat of Aloe bowiea (Asphodelaceae: Alooideae). Aloe 28:9-17. Smith, G.F. and van Wyk, A.E. 1989. Biographical notes on James Bowie and the discovery of Aloe bowiea Schult. et J.H. Schult. 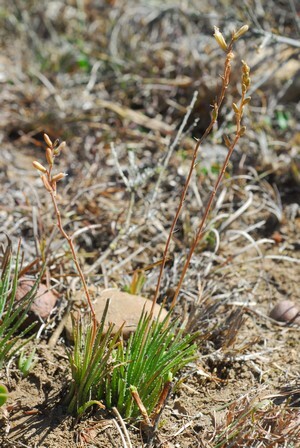 (Alooideae: Asphodelaceae). Taxon 38(4):557-568. Smith, G.F. and van Wyk, A.E. 1990. 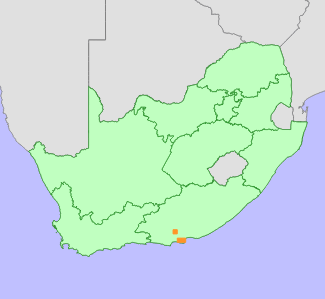 Notes on the distribution and habitat of Aloe bowiea (Liliaceae/Asphodelaceae: Alooideae), an endangered and little known species from the eastern Cape. Bothalia 20(1):123-125. Smith, G.F. and Van Wyk, A.E. 1993. Notes on the pollen morphology and taxonomy of Aloe bowiea (Asphodelaceae: Alooideae). Madoqua 18:93-99. Smith, G.F., Glen, H.F., Van Wyk, A.E. and Condy, G. 1994. Aloe bowiea. Flowering Plants of Africa 53:80-84.